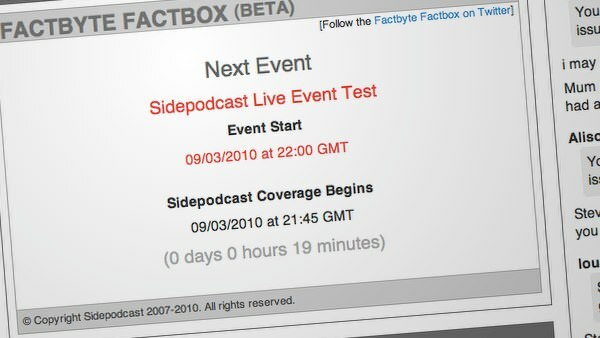 Sidepodcast is today turning its F1 coverage up to eleven, with the release of the all new Factbyte Factbox. The interactive web panel enables us to provide real-time updates on any live event, be it an F1 session, another motorsport event or live streaming podcast. Designed to take live shows and live racing to the next level, the FBFB will provide a secondary stream of information, highlighting any relevant data depending on circumstance. For example, offering up-to-date scoring during a panel show, or listing the closest battles during a race. Almost one year on and that is exactly what we're launching today. Additionally, we're planning on using the tool to augment future live streaming podcasts, providing real-time show notes and enabling interaction via live voting, results of which will be fed back into recordings. We should point out that what we're launching today isn't the final iteration of the web panel. It carries a "beta" tag because it is a service that's still undergoing heavy development. However, we felt that this was something that should be available from the very start of the F1 season, and thus we're opening the doors today. We're expecting teething troubles coupled with rapid development for the next few months. If you're interested in seeing what all the fuss is about, the live commenting page currently houses the FBFB. The plan is to make it available via other pages in due course. Furthermore, we'll be running a live beta test at 21:45 GMT, should anyone be available to offer feedback. Hello to one and all. The Factbyte Factbox makes it's triumphant (second) debut. Hello to Chris and Lukeh and Steven and Lou! I intend to give you updates about the F1 sessions, great notes from the Twitterverse, and any fabulous comments from your good selves. I like that Formula One business, you know. Cars and drivers and wheels and stuff. Don't forget Christine's F1 Minute podcasts. Today's news: 09-Mar-10: McLaren Confident Rear Wing is Legal McLaren are sure there is no problem with their designs, whilst Silverstone is almost done. A great comment from RG: I think this means the LCLT is pretty much officially the second most awesomeness thing ever. I hope everyone has checked out Autosport's rather funky 2010 Season Guide. That is enough for my first outing, I think. I need to recharge my batteries before the weekend. Thank you for your attention.